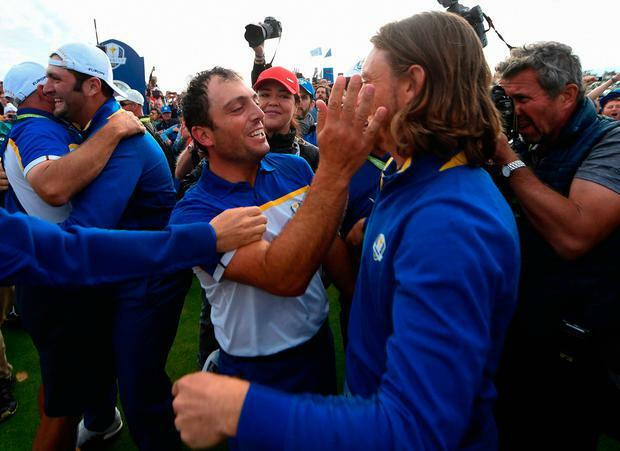 Rory McIlroy has jokingly hinted that he doesn't know "what is going to happen tonight" between Europe's star pairing Francesco Molinari and Tommy Fleetwood after their famous victory in Paris. 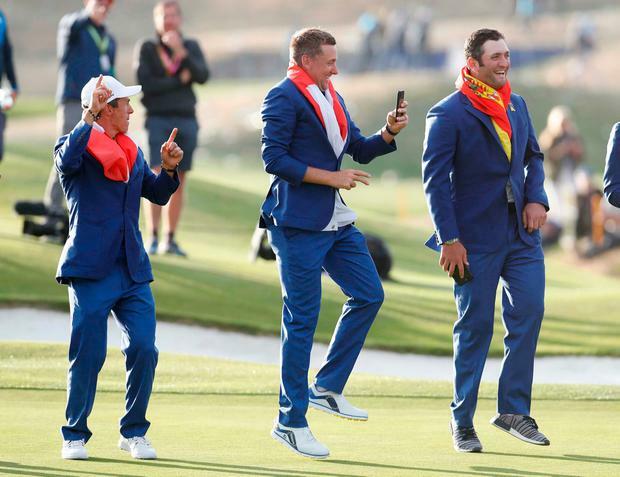 The pairing, dubbed 'Moliwood' by fans, were the stand-out performers on the European team as they won all four of their matches together over the weekend. 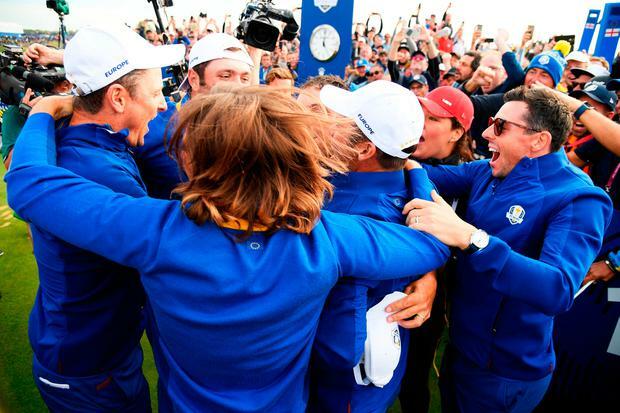 Europe won back the Ryder Cup with a comprehensive victory over the United States at Le Golf National in Paris on Sunday. Thomas Bjorn's men retained the trophy they lost at Hazeltine Golf Club in 2016 with a resounding triumph over the much-fancied Americans. 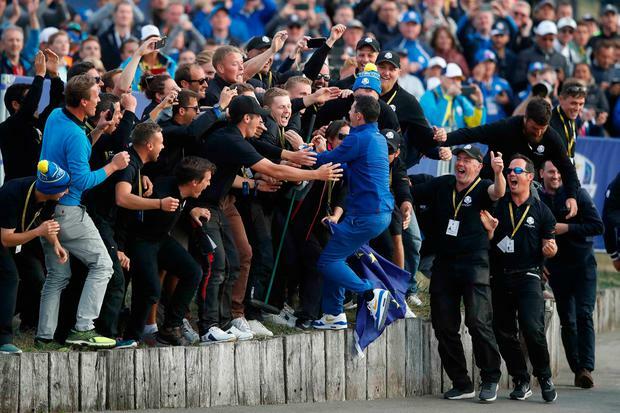 And when asked what celebrations the team had in store after their famous victory, McIlroy jokingly suggested that the chemistry between 'Moliwood' was as strong off the course as it is on it. "I don't know, I mean Francesco and Tommy have got awfully close this week but I don't know what's going to happen between them tonight," McIlroy told Sky Sports. The Northern Irishman went on to hail the tight-knit nature of the European team and said the time spent together as a group is memorable regardless of the outcome. "It's been incredible, the atmosphere has been fantastic. Even after the loss at Hazeltine we had a good time on Sunday night because it's the last time we're all going to be together for a while, so this one will be extra special. "We thought this course would suit us, it would suit our style of game and it's worked out that way," McIlroy added. Stenson closed out at a 5&4 victory over Watson to take Europe to 15 and a half to nine and a half. Captain's pick Garcia won his match 2&1 on the 17th and looked to the sky before being overcome with emotion, hugging wife Angela. In securing the victory he became the all-time Ryder Cup leading points scorer with 25 and a half points, eclipsing Sir Nick Faldo's record. "I don't usually cry but today I couldn't help it. What a week," said Garcia. "It has been a rough year but we fought hard and I'm so thankful for Thomas for picking me and believing in me. I am so happy to get the cup back." On his record the Spaniard added: "It means a lot but at the end of the day it's about the team and I was happy I was able to help with some of the points I won. "It's a bonus, something I never thought I'd have the possibility of doing it but these guys are unbelievable. "A lot of people thought the Ryder Cup was over before it was played. I guess unfortunately they picked the wrong team." Hatton's match against Reed finished in a 3&2 defeat, leaving just Noren out on the course one up against DeChambeau. Fleetwood, who was part of Europe's star pair with Molinari, paid tribute to his partner. Poulter justified Bjorn's wild card selection with his crucial win over Johnson. "That little gold trophy burns pretty hard inside. That kept me going. I wanted to be here in Paris. I knew it would be extra special if I made it," he said. "I had to rely on a pick from Thomas. To get that pick, to come out today and turn that match around down the stretch and deliver a point is something I am never going to forget. I don't think I can quantify how much it means. You see it in the emotion when we hole putts and the emotion of the fans. "To be able to represent Europe is extra special. To win this thing back is even more special." Noren, one up playing the last, was facing losing the hole after DeChambeau hit his approach within 18 inches but the Swede sank a superb 30ft putt for an equalling birdie to win one up. Europe finished 17 and a half to 10 and a half victors.